Is a fitness tracker on your wish list this year? 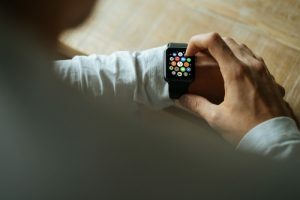 The wearable technology gadgets seem to be on wrists everywhere, so you’ll have lots of company. By the end of 2015, people in the United States owned nearly 33 million of the devices. Fitness trackers count steps and calorie burn. They can show how many hours you actually slept. Some measure heart rate and estimate oxygen uptake. All from wearing what looks like a rubber bracelet. Keeping up with all that data can be addictive. I’ve seen people jumpstart exercise habits because they “have to” walk so many steps per day. They can’t stand to see lagging numbers on their trackers. On the other hand, fitness trackers may be the new gym membership. People often quit wearing the devices after a few months. It’s the same with gyms. Go to a health club in January and it’s likely to be packed. By spring, the crowd will have thinned. Fitness trackers may be a high-tech phenomenon, but they are rooted in an old and simple idea. It started in Japan in the mid-1960s when a company marketed a pedometer for walking 10,000 steps a day. That number is the equivalent of about five miles and the notion spread: 10,000 daily steps became a common benchmark for the right amount of exercise for good health. In The Step Diet: Count Steps, Not Calories to Lose Weight and Keep it Off, author James O. Hill suggests starting with a baseline for determining your daily step target. For a few days, walk like you normally do and see how many steps you’re taking in an average day. If you’re like many people who are basically sedentary, you’ll probably be shocked to see how few steps you actually take. When Dr. Hill’s book was published in 2004, step-counters tended to be inexpensive plastic gadgets that hooked to a waistband. The difference between step-counters and today’s fitness trackers is kind of like dial phones vs. smart phones. Be honest: Input your correct weight, age, daily food intake and other variables for best results. Wear it regularly: All-day use, from morning till bedtime, is preferable. Pick the right device: There are many types of fitness trackers, including ones made for specific fitness routines like running. Find one with the features, price and wearability that work for you.